I was contacted by Born Pretty Store - The nail art and crafts store online, to announce their upcoming giveaway. 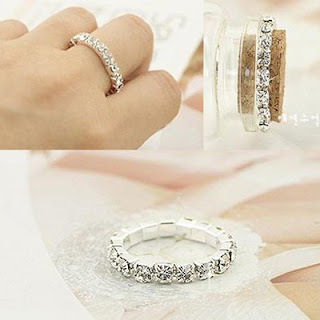 BornPrettyStore.com will offer 1000pcs FREE GIVEAWAY (Crystal Ring) on this Thursday (19th, April). The prize. A Rhinestone ring. Specific time and a special coupon code will be announced on the day in the Home News, Facebook, Twitter and other places. If you want to get it, please pay close attention to the update information. 1. Starting time: April 19, 2012. Ending time: When All of the 1000pcs giveaway prizes have been ordered. 2. The coupon code will be a totally new coupon, so everyone can have a chance to get it. 3. This is a international FREE GIVEAWAY, no minimum order limit, and free shipping. 1. Like BornPretty's Facebook page. 2. Share this giveaway news with your friends and on some of your local websites, your Facebook, Twitter or blog. When you use a coupon to order this freebie here, please leave your share post link in the comment, or we will contact you to get the link and then send out the giveaway. Bottom line? "Like" BornPretty on Facebook, and stay tuned for the coupon code for this free rhinestone ring to be posted on their page.